Machu Pichu is one of the most exciting archeological discoveries of the 20th century. High in the Andes northwest of Cuzco, Peru, this former sacred city of the Inca leaders lay undiscovered when the Inca fell due to the Spanish invasion in the sixteenth century. 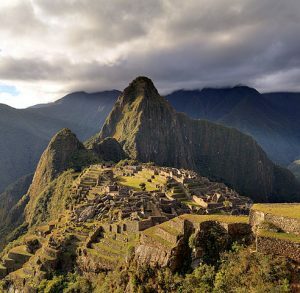 The Spanish never found Machu Pichu so it remained virtually untouched for hundreds of years and its location known only by those who lived nearby. In the summer of 1911 American archeologist Hiram Bingham was directing a Yale archaeological expedition to find Vilcabamba*, a lost city of the Incas. Vilcabamba was alleged to have been a secret stronghold of the Incas during the rebellion against the Spanish in the sixteenth century. Its location was a mystery and the Spanish never found it but Bingham was determined to follow the clues scattered in chronicles from that period. The clues seemed to indicated it was near Cuzco. Traversing the Andes even during the best of times is not easy and he risked his life visiting several Inca sites. He was urged by a local prefect to visit the Urubamba River valley to find the ruins of Choquequirau (“Cradle of Gold”). He ended up meeting Melchor Arteaga,a Quechua-speaking resident, and on 24 July 1911 was taken to the ruins of Machu Pichu. He found well preserved stonework and noticed the similarity of the structures to the Temple of the Sun in Cuzco. Since the ruins were covered in vegetation, a second expedition in 1912 was undertook to excavate the area. 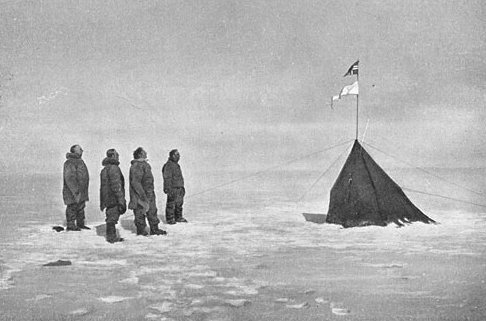 Subsequent expeditions would continue to do that task in 1914 and 1915. Reconstruction would also take place as well to restore the city to its former glory. Peru declared it a Historical Sanctuary in 1981 and UNESCO has declared it a World Heritage Site. Unlike Hiram Bingham and others who came to the site in the early days, visitors can either walk the Inca Trail to Machu Pichu (there are several options from the full six day hike to just one day) or take a train. Due to the effects of so many people visiting the site, Peru has put restrictions to limit the numbers of hikers and visitors to Machu Pichu. Those taking the longer trails should know that the ascent can lead to altitude sickness. Machu Pichu is 7,970 feet above sea level. If you have ever visited Cuzco, there is a reason they have air tanks ready for visitors. *Bingham believed he had found Vilcabamba but in 1964 American archaeologist Gene Savoy believed the excavation of Espíritu Pampa was a more likely candidate. Subsequent excavations and other research has determined that this was the likely site of Vilcabamba. Going Down To Liverpool was originally written by Kimberley Rew for his group Katrina and The Waves. The song was part of the album Shock Horror! (1982)that was only issued in Canada. The Bangles covered the song in their 1984 debut album All Over The Place. The song while a minor hit in England found little traction in the U.S. Their second album Different Light in 1986 was more popular and Going Down to Liverpool was re-released as a single. It did much better though still a minor hit. But it was the video directed by Tamar Simon Hoffs–the mother of Bangles singer Susanna Hoffs–that would give the song greater visibility because it had in it a well known actor. That actor, known by fans of Star Trek as Mr. Spock, was a friend of the Hoff’s family. His appearance made this video a popular one when it ran. Sometimes people forget to remove things from items before donating to charity. 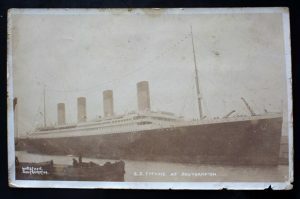 And such was the case when a rare Titanic postcard slipped out of a book donated to Books For Amnesty in Bristol, UK. 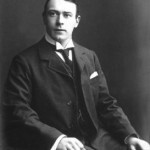 The card, which shows Titanic docked in Southampton before its maiden voyage, is dated to 1912. And was done by a local photographer. Colin Richardson, a volunteer at the store and has an interest in postcards himself, was astonished at the remarkable find. The card has been put up for sale on Ebay and could fetch close to £99 ($130). Waiter’s Pad Blank Page: Waiters from the exclusive à la carte restaurant on board would jot down lunch and dinner orders on pads such as this for the chefs to prepare in the galley. Unlike the First Class Dining Saloon, which cooked in larger quantities, the à la carte restaurant prepared each individual meal to order. Left Shoe: This men’s leather shoe fragment consists of the welt, top cap and partial quarter with the insole. Attesting to the meticulous care under which all artifacts are conserved, this shoe has never been previously exhibited due to its fragile condition. After August 1 they are scheduled to return to the conservation facility where they will only be available to researchers. *Celine Dion is sporting a Titanic sweatshirt that is getting some media buzz. Commonly called a hoodie these days, this is not something to be found at your local big box retailer. The 80% cotton/20% polyester and made in Portugal will cost you $885 at Vetements. *I knew it was going to happen someday. A proposed Chinese-American film will offer a “fresh take” on Titanic. And what will that be? Well according to China Film Insider the film plot will involve a conspiracy. No doubt it will weave in elements made popular by those who believe the Illuminati was involved, that Olympic and not Titanic was sunk for insurance money, or that a dastardly German plot using a submarine was involved. Or perhaps it will go the supernatural route. A cursed Egyptian mummy is brought aboard and escapes causing mayhem and death. Abbott and Costello could have had fun with that one. *The former home of Thomas Andrews in Belfast, N.I. has been for some years been the home of the Irish Football Association. They have since moved their headquarters and put the property up for sale. According to Belfast Telegraph, it has been purchased by Action Cancer and will be used to treat women suffering from breast cancer. The Star Spangled Banner and America The Beautiful are traditional favorites for Fourth of July celebrations (and other important days as well). The Battle Hymn of The Republic is another favorite. This rendition is performed by the U. S. Army Chorus. It is a stirring song written during the American Civil War by Julia Ward Howe.